The closing date for gap funding applications has been extended to Friday, August 18, because not enough students have applied for it. According to the Wits Financial Aid and Scholarships Office (FASO), only 3 600 students have applied since the beginning of the year yet all Wits students are encouraged to apply. FASO manager, Mukhathutshelwa Ngobeni, told Wits Vuvuzela that it came as a shock to her that so few students had applied for funding. “Students have been given an opportunity to apply for gap funding and they are not applying. I could say less than 1% have applied and we don’t understand,” said Ngobeni. She said that FASO had even gone as far as eliminating the extensive paperwork required for students to fill in applications. If the funds are still not allocated after the closing date, they will go back to the government, said Ngobeni. “We need as many students to apply. Government is prepared to give us more money. The money that they gave us we could not allocate all of it. So now we don’t want to send anything back to them but we don’t have the numbers to reach what they gave us,” she stressed. Letsualo went on to say that she thought many students did not apply for the funding because of a lack of clear communication from the university. “The information is so distorted; you’re not exactly sure who can get it and who can’t, and exactly the amount you can get. So you can imagine how intimidating it is for the student community. So, not everyone is going to pursue it,” she added. Communication from the university about the funding was done via emails and social media. However, the Facebook post that was sent out on Monday July 31, received about 44 ‘like’ reactions and only seven comments. 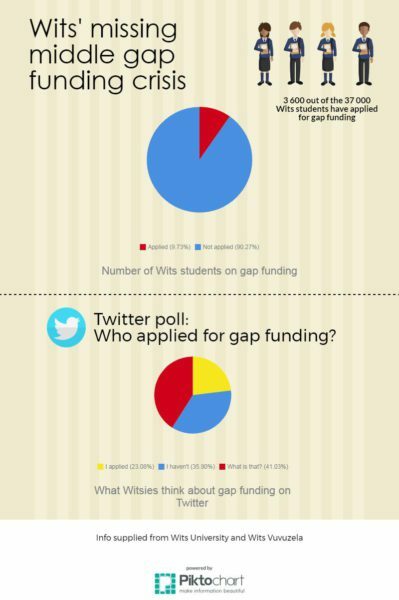 Wits Vuvuzela conducted a Twitter poll on students’ awareness about the funding. The poll lasted 24 hours. Out of 39 people who participated, only nine (23%) said they had applied for the funding, while 14 (36%) said they hadn’t. The highest number, 16 (41%), said they weren’t sure what gap funding is. A third-year BSc biology student, Kamogelo Kgooe, who hadn’t applied, said that one of the main reasons was that he felt he would not get it. “Most of the times, you apply for something and you end up not getting it,” he said. The other reason was because he was unsure how to. The gap funding came as a solution from government, working through the Department of Higher Education and Training, to assist the so-called missing middle students who would not afford the 8% fee increase that was announced last year. This type of funding, however, is only available to South African citizens and permanent residents whose household income is less than R600 000 per year. It is available for both undergraduate and postgraduate study. Students can access the application for the gap funding on the Wits student self-service website.